Malamatenia is a self employed dancer and back school teacher, movement therapist, personal trainer, works with health insurances in rehab measures in occupational health promotions and is a certified laban movement analyst. 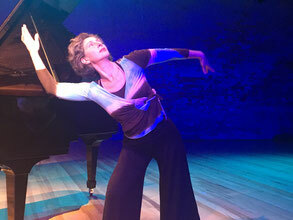 She also teaches Bartenieff Fundamentals and Laban Movement Studies in Bremen in a training college for dance and movement therapist students. She is founder of the Alive & Flow Institut in Achim for holistical dance and body work where she teaches introductory courses in Bartenieff Fundamentals and Laban Movement Studies. As a passionate and freelance dancer she is a member of the association for artists Realtime – Forum Musik e.V. in Bremen. As emotional and expressive dancer she is involved in lecture concerts with contemporary and classic music where she makes effort and space harmony knowledge to Laban visible to a wide audience. As a freelance artist, painter, dancer and choreographer she cooperate with several artists on her own projects and is also member of film, theater, music or dance productions around Germany and Europe.